The Hitachi F-7000 Fluorescence Spectrophotometer surpasses the competition with its superior performance, functionality, and reliability. Designed to conserve benchspace (620 mm W x 520 mm D x 300 H mm), the F-7000's Ultra-High Sensitivity (S/N: 800) and High-Speed Scanning (60,000 nm/min) provide unparalleled performance. Control via FL Solutions software offers 3-D measurements, Wavelength and Time Scanning, Quantitative Calculations, and functionality to facilitate compliance with FDA's 21 CFR Part 11 regulations. 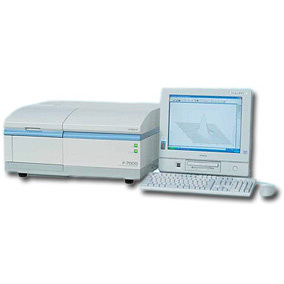 Also, the F-7000 is available with a widevariety of accessories, such as a microplate reader to serve various applications. Engineered for a wide range of fluorescence applications, e.g., industrial, environmental, pharmaceutical, biotechnology, and more, the F-7000 will significantly enhance the productivity and capabilities of your laboratory.